João Luiz, member of the Brasil Guitar Duo, will discuss the rhythms and other characteristics of the music of his native Brazil. The presentation will be preceded by open-mic playing time for members. Sign up in advance to play — see the Member Events page for details. NYCCGS Member Events are free and open to all members and first-time guests, and are supported by a generous grant from the D’Addario Music Foundation. 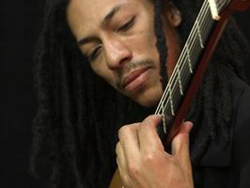 Joao Luiz won the 2006 Concert Artists Guild Competition in New York as a member of the Brasil Guitar Duo, resulting in a full global touring schedule and numerous critically acclaimed recordings. He has premiered works by composers such as Leo Brouwer, Egberto Gismonti, and Marlos Nobre. He was on the faculty of Santa Marcelina College and Festival Internacional Eleazar de Carvalho in Brazil. He has recorded for the labels Avie, Naxos, CAG, and Guanabara Records. His arrangements has been recorded and played by Marina Piccinini, Fabio Zanon, Quaternaglia, Marco Pereira, Silvie Jensen, Na Ozzetti, Paquito D’Rivera, Parker String Quartet, The Newman & Oltman Guitar Duo, and Hye-Jin Kim, as well as the Brasil Guitar Duo. He studied in Brazil with Henrique Pinto and attended private classes with Fabio Zanon, Paulo Martelli, Sérgio Abreu, Alice Artzt, and Frederic Hand. He recently completed the master’s program at Mannes College of Music where he studied with Michael Newman.